Windows has an annoying habit of displaying thumbnails for folders that you may not want thumbnails for, like the My Pictures folder. For me, it’s better to have the My Pictures folder viewed in List or Details view and all of the folders underneath My Pictures to be shown as thumbnails. The really annoying thing is that even if you go to Tools, Options, View, and click on “Apply to All Folders”, Windows may still revert back to thumbnail view! This happens because Windows will show a folder in thumbnail view if it finds a THUMBS.DB file in the folder. 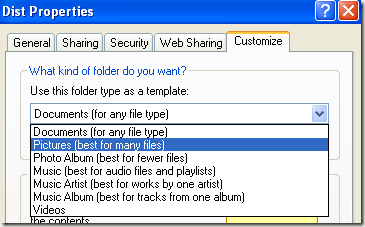 THUMBS.DB is a cache file that basically is used by Windows in any folder it finds a picture or video so that the next time you view the folder, the thumbnails will be loaded faster so you don’t have to wait. However, with the current speed of computers, it’s pretty useless and only takes up more space on your computer. You can delete the file and the thumbnail view will go away, but only for some time before Windows re-creates it. You can prevent this from happening by disabling the thumbnail cache in Folder Options or via a registry hack. In Explorer, go to Tools, then Folder Options and click on the View tab. 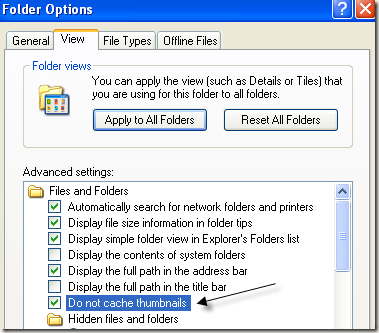 Check the box “Do not cache thumbnails” and click OK. Now Windows will not automatically create a THUMBS.DB file for a folder it deems needs thumbnails, which means you can set a folder view to list or detail and it will remain that way. Make sure to first delete the THUMBS.DB file if one existed already. Double click on the DisableThumbnailCache key in the right-hand pane and change the value to 1. If the key is not there, go to Edit, then New and choose DWORD Value to create one with the same name. Close the Registry and reboot your computer for the changes to take effect. If you have a lot of folders with lots of pictures, it would be best to disable the thumbnail cache because each picture in the cache is about 2KB, meaning a 1000 pictures in one folder would result in a cache of 2MBs! This is a guest post by Aseem Kishore from HelpDeskGeek.com, which focuses on providing Help Desk tips to IT Professionals.